ELUCHIE C.N., ORANUSI S., AKUJOBI C. O., ALAGBAOSO S.O. Effect of phytol on the dehydrogenase activity of Staphylococcus aureus Bacillus cereus, Pseudomonas aeruginosa and Enterococcus faecalis isolated from grilled meat was examined via dehydrogenase assay using 2,3,5 – tripheny tetrazolium chloride (TTC) as the electron acceptor. The bacteria isolates were exposed to various concentrations of phytol (0-2000 μg) in a nutrient broth. 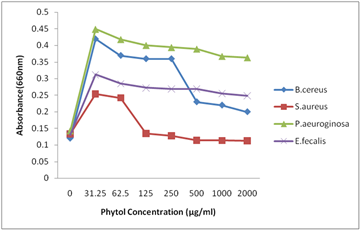 The minimum inhibitory concentration (MIC) and minium bactericidal concentration (MBC) values of phytol against the bacterial isolates were found in the range of 31.25 μg /ml to 250 μg /ml and 125 μg /ml to 250 μg /ml respectively. Effect of phytol on the dehydrogenase activity of the bacterial isolates showed that gram negative Pseudomonas aeruginosa had higher dehydrogenase activity than the gram positive Bacillus cereus, Enterococcus faecalis and Stpahylococcus aureus. The effect of phytol on the dehydrogenase activity varied significantly among the bacterial isolates. This result indicates that phytol could be used as an antibacterial agent in food industry to inhibit the growth of certain food borne pathogens. C.N., ELUCHIE, et al. "Efect of Phytol on Dehydrogenase Activity of Bacterial Isolates from Grilled Meat." American Journal of Food Science and Technology 4.1 (2016): 1-6. C.N., E. , S., O. , O., A. C. , & S.O., A. (2016). Efect of Phytol on Dehydrogenase Activity of Bacterial Isolates from Grilled Meat. American Journal of Food Science and Technology, 4(1), 1-6. C.N., ELUCHIE, ORANUSI S., AKUJOBI C. O., and ALAGBAOSO S.O.. "Efect of Phytol on Dehydrogenase Activity of Bacterial Isolates from Grilled Meat." American Journal of Food Science and Technology 4, no. 1 (2016): 1-6. For years, food borne illness resulting from consumption of food contaminated with pathogenic bacteria and/or their toxins has been of vital concern to public health. Among food borne outbreaks in the United States during 1983-1987 in which the etiology was determined, bacterial pathogens caused the largest number of out breaks (66%) and cases (92%) . Thus, controlling pathogens could reduce food borne outbreaks and assure consumers a safe, wholesome and nutritious food supply. Plants contain a great number of secondary metabolites, many of which display biological activity as “natural products” with a role in plant defense against bacteria, fungi and other microorganisms. There has been a growing interest in new and effective antibacterial substances from natural sources like plants to reduce cases of bacterial diseases. In many cases, antibacterial compounds from plants, herbs and spices in low concentrations have been used effectively in the food industry. Biologically active secondary metabolites of spices, herbs and medicinal plants, due to their diverse range of antibacterial activities, are becoming increasingly important in food industry as potential food preservatives to control food borne pathogenic bacteria . Food borne pathogenic bacteria cause several food borne diseases . The indiscriminate and excessive use of a wide range of chemical bactericides has led to extended environmental pollution and the production of resistant pathogen populations. During the last few years, research on plant-based antibacterial agents has produced a diverse range of products with novel modes of action, which are expected to have a significant impact on the control of food borne diseases in coming decade. Therefore the demand for plant based antimicrobials as novel bactericide sources for controlling food borne pathogens is rapidly increasing (Ulubelen et al., 2000; Kubo et al., 2004; Giang et al., 2006). Some synthetic chemicals have been used to control microbial growth and reduce the incidence of food borne illness. Although these synthetic preservatives are effective, they might be detrimental to human health. Consumers are concerned about the safety of food products that contain artificial preservatives. The ban of chemical additives by some consumers has driven the food industry and food research towards the search for natural antibacterial compounds from plant origin. Many natural compounds (e.g. terpenoids) found in dietary plants possess antibacterial activities against food borne pathogens (Deller et al., 1996; Singh and Singh 2003; Aiyelaagbe et al., 2007). Phytol is an acyclic diterpene alcohol that can be used as a precursor for the manufacture of synthetic forms of vitamin E  and vitamin K1 . Phytol is likely the most abundant acyclic isoprenoid compound present in the biosphere and its degradation products have been used as biogeochemical tracers in aquatic environments . Dehydrogenase is an enzyme that catalyzes the removal and transfer of hydrogen from a substrate in an oxidation-reduction reaction. It is an enzyme that mobilizes the hydrogen of a substrate so that it can pass to a hydrogen acceptor . Measurement of microbial enzyme activity has been used in the assessment of ecotoxicological impacts of environmental substrates. In this regard, dehydrogenase activity has been widely used. The dehydrogenase assay is an effective primary test for assessing the potential toxicity of metals to soil microbial activities , toxicity of metals to planktonic  and heterotrophic  bacteria from tropical river sediments. Toxicity of antimicrobial agents to pathogenic bacteria has been accessed using the dehydrogenase assay [10, 11]. The aim of this work is to determine the effect of phytol on the bacterial isolates from grilled meat. The materials used in this research work include; phytol from sigma chemical industry, USA, grilled meat (suya and pork),sterile bottles, Petri dishes, conical flask, test tubes, measuring cylinder, wire loop, glass rod, aluminum foil, cotton wool, pipettes, forceps, cork borer, autoclave, microscope, weighing balance, Bunsen burner ,incubator, spectrophotometer, rotary incubator. Reagents used include; dimethyisulphoxide (DMSO) obtained from chevron Philips chemical company USA, tannic acid from powder park chemical, India, casein-Universal buffer, amyl alcohol and triphenyl formazan were obtained from sigma chemical industry, USA. Trichloroacetic acid from hydrite chemical company, brook field,2,3,5-triphenyl tetrazolium chloride [TTC] from BDH England, methyl red from jigchem universal, mumbia and NaCL from cellmark , USA. All reagents were of analytical grade. The media used were nutrient agar, macConkey agar and nutrient broth-glucose obtained from becton Dickinson and company, USA respectively. Luria-bertani broth and yeast extract casein broth were obtained from sigma chemical industry, USA. Brain heart infusion broth and agar-solidified Mueller hinton broth were obtained from hardy diagnostic, USA. A total of thirty samples of grilled meat (suya and pork) were collected from five different locations namely; world bank housing estate in new Owerri, Ihiagwa in Owerri suburb, Ama Awusa in Owerri town, Mbieri in Mbaitolu L.G.A and Akabo in Ikeduru L.G.A, all in Imo state. Nutrient agar and MacConkey agar were used for the isolation of the bacterial organisms and they were prepared according to the manufacturers’ instructions. Food-associated bacteria were isolated from grilled meat products, Suya and pork meat, using Nutrient agar and MacConkey agar. Ten grams of suya and pork meat were weighed aseptically into 90ml sterile distilled water, agitated for 5mins and serially diluted ten fold. 0.1ml of (10-8 dilution) was spread on Nutrient agar and MacConkey agar and the plates incubated at 37°C for 24hrs and 48hrs respectively. After incubation, single morphologically well-formed colonies were picked and subcultured. The colony forming unit per gram (CFU/g) was calculated. Colonial morphology, microscopic characteristics, and biochemical and carbohydrate fermentation tests of the isolated organisms were used for characterization. Each of the sub-cultured isolates were further sub-cultured aseptically from the plates by streaking a loopful of the bacterial colony onto a freshly prepared Nutrient agar and MacConkey agar plates and incubated at 37°C for 24hrs and 48hrs respectively. After incubation, discrete colonies were picked and Gram stained. Microscopy was carried out inorder to confirm their purity. Each pure colony was picked and inoculated onto sterile Nutrient agar slants in screw- capped bottles. These were incubated at 37°C for 24hrs and stored in the refrigerator at 4°C as stock culture for further tests. Colonial morphology, microscopic characteristics, and biochemical and carbohydrate fermentation tests of the isolated organisms were used for characterization. This was carried out using a broth medium composed of 10g of peptone, 5g NaCl, 0.03g methyl red and 1litre deionised water. After shaking, 9ml of the above mixture were dispensed into test tubes. Durham tubes were then introduced into the tubes in an inverted position to ensure that each durham tube was filled with the medium. The media was sterilized at 121°C for 15 mins. A solution of each sugar (Glucose, Sucrose, Maltose, Lactose, Mannose and Xylose) was prepared by dissolving 1g of each sugar in 100ml of distilled water and sterilized at 121°C for 8 minutes. After cooling, 1ml of each sugar solution was aseptically added into the 9ml of the basal medium. Each tube was inoculated with the bacterial isolate. This was incubated for 48hrs.The tubes were checked for gas production in the durham tubes and change in colour of the medium from red to yellow indicated acid production. The tube which was not inoculated with the bacterial isolate served as the control. The minimum inhibitory concentration (MIC) of the compound (phytol) was tested by a two-fold serial dilution method . The test compound was first dissolved in dimethylsulphoxide (DMSO), incorporated into Luria-Bertani medium for bacterial pathogens to obtain a concentration of 2000µg/ml and serially diluted to achieve 1000, 500, 250, 125, 62.5, and 31.25µg/ml. The final concentration of DMSO in the culture medium was maintained at 0.5% (v/v). A 10 μl standardized suspension of each tested organism (1.5×108 CFU/ml) was transferred to each tube. The control tubes containing only bacterial suspensions were incubated at 37°C for 24h. The lowest concentration of the compound, which did not show any growth of test organisms after macroscopic evaluation was determined as MIC, and was expressed in µg/ml. Further, the concentrations showing complete inhibition of visual growth of bacterial pathogens were identified, and 50µl of each culture broth was transferred onto the agar plates and incubated at 37°C for 24hrs. The complete absence of growth of bacterial colonies on agar surface in the lowest concentration sample was defined as the minimum bactericidal concentration (MBC). Each assay in this experiment was replicated three times. The method as described by Arai et al. , was adopted. The compound to be tested was added at the indicated concentrations, to 10ml aliquots of brain heart infusion (BHI) broth in test tubes without any solubilizing agent or surfactant. An aliquot of an overnight culture of bacterial isolates was added to each sample to give approximately 105 CFU of the different bacterial isolates per ml. Each culture was incubated, with shaking at 40rpm, for 24hrs at 37°C. The inhibitory activity of the compound being tested was monitored turbidimetrically. The optical density at 660nm was determined with a spectrophotometer. Dehydrogenase assay method as described by Nweke et al. was employed. Dehydrogenase activity was determined using 2, 3, 5-triphenyltetrazolium chloride (TTC) as the artificial electron acceptor, which is reduced to the red-coloured triphenylformazan (TPF). The dehydrogenase activity of the bacterial isolates was determined in 3.4ml volume of nutrient broth-glucose-TTC medium supplemented with varying concentrations of phytol (0 -2000µg/ml) in separate screw-capped test tubes. A 0.3ml of suspension of the bacterial isolate was inoculated into triplicate 20ml screw-capped tubes containing 3.4ml of phosphate buffered (pH 7.2) nutrient broth-glucose medium amended with toxicant (phytol 0-2000 µg/ml) and preincubated on a rotary incubator (150rpm) at room temperature (28± 2°C) for 24 hrs. The TPF produced was extracted in 4ml of amyl alcohol and determined spectrophotometrically. The amount of formazan produced was determined from a standard dose-response curve (0-50mg/l TPF in amyl alcohol) at a reasonable R2 value. Dehydrogenase activity was expressed as micrograms of TPF formed per mg dry weight of cell biomass per hour. The results obtained from the data were subjected to Analysis of variance (ANOVA) and values of P≤ 0.05 were considered statistically significant according to Onuh and Igwemma . Out of a total of 30 samples of grilled meat analyzed, 8 pathogenic organisms were isolated. 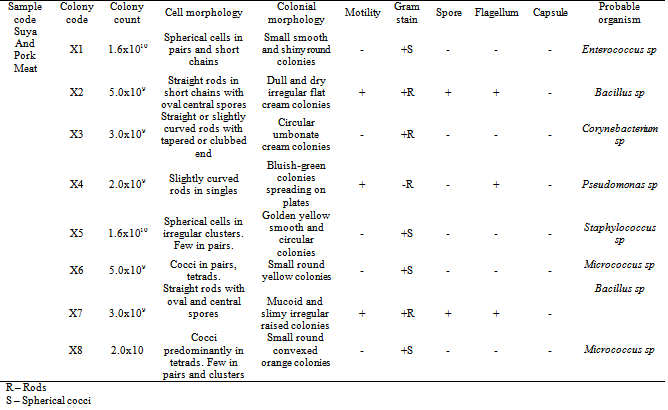 The most common isolates were B. cereus, S. aureus, E. faecalis and P. aeruginosa as shown in Table 1 and Table 2. 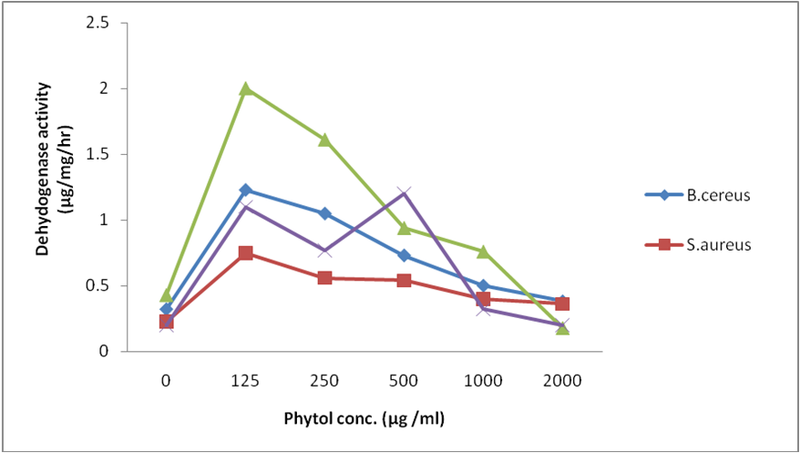 The response of these bacterial isolates to phytol showed that phytol has potent inhibitory effect in terms of MIC and MBC values against all the tested bacterial pathogens. 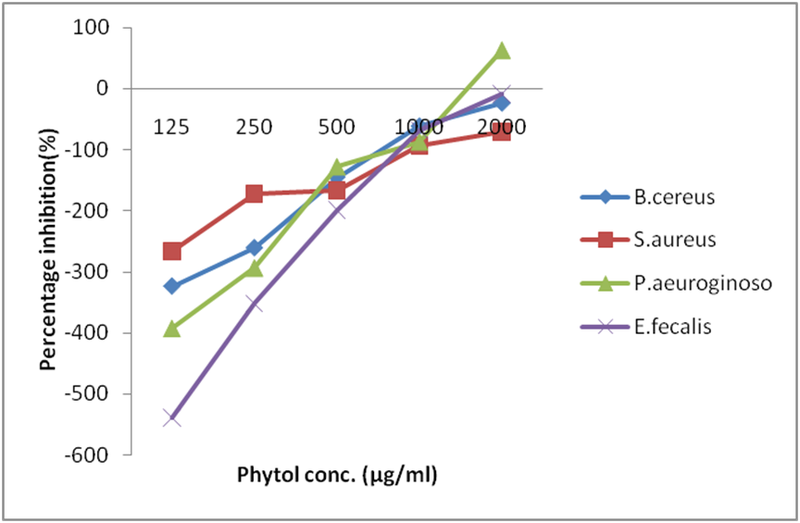 As shown in Table 3, the MIC and MBC values of phytol against the tested bacterial pathogens were found in the range of 31.25µg/ml to 62.5µg/ml and 125µg/ml to 250 µg/ml, respectively. Pseudomonas aeruginosa and Staphylococcus aureus were found highly susceptible bacterial pathogens to the phytol having MIC values of 62.5µg/ml and 31.25µg/ml respectively and MBC values of 125µg/ml respectively, for each bacterial pathogen. Phytol also had potential antibacterial effect against B.cereus and E. faecalis. Similarly, Mathabe et al. (2008), reported the antibacterial activity of plant based terpenoid compounds against a panel of food borne pathogenic bacteria,showing their potential antibacterial effect. Broth dilution with shaking (BDS) method was used to investigate the inhibitory effect of phytol on the growth of S. aureus, B. cereus, P. aeruginosa and E. faecalis. 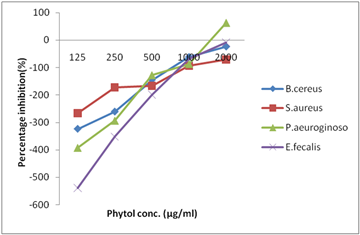 Figure 1 shows that in comparison to control absorbance; phytol was stimulatory to the growth of B.cereus; P. aeruginosa and E. faecalis at all concentrations but inhibitory to S.aureus at concentrations between 250µg/ml and 2000µg/ml. The time kill assay demonstrated that the growth of the different bacterial isolates decreased with increase in concentration except in S. aureus and P. aeruginosa. Inhibitory effects of cell growth decreased at elevated concentrations even though a certain fraction of the bacteria in each bacterial suspension was killed. Thus, surviving bacteria grew faster than did cells under control conditions. It appears that phytol has both growth-inhibitory and growth accelerating activities. The net effects depended on the final concentration, with inhibitory activity predominating at lower concentration. Results obtained from the control samples showed that these organisms were able to reduce TTC to red formazan at variable rates and extent. The gram-negative P. aeruginosa had higher rates of dehydrogenase activity than the gram + positive B. cereus, E. fecalis and S. aureus. This variation may be due to differences in cell wall components or dehydrogenase systems, since different micro-organisms have been reported to have different dehydrogenase systems . This result is also in consonance with the work of Nweke et al., . 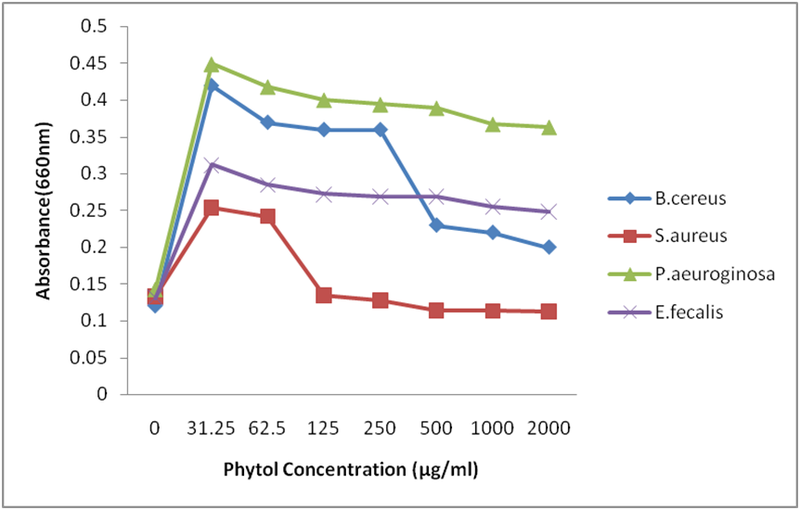 The effects of the different concentrations of phytol on the bacterial isolates with respect to the dehydrogenase activity and its inhibition are shown in Figure 2. The responses of the bacterial dehydrogenase activities to phytol are concentration – dependent and vary between the organisms. The dehydrogenase activity inhibition observed in this study is consistent with those observed by other workers using plant extracts [2, 10, 11]. 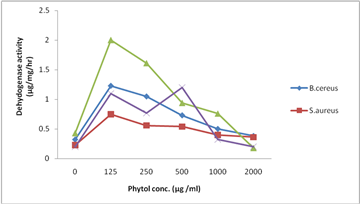 Result presented in Figure 3 showed that P. aeruginosa had higher percentage inhibition than the other bacterial isolates at all concentrations of phytol. This implies that P. aeruginosa was more sensitive to the deleterious effect of phytol than the other bacterial isolates. Food safety is a fundamental concern of both consumers and food industry, especially as the number of reported cases of food – associated infections continues to increase and is rapidly changing (Alzoreky and Nakahara, 2003). Recurring out breaks of food borne illness caused by food borne pathogenic bacteria have sustained the demand for preservation systems that limit the proliferation of food borne pathogens in refrigerated, minimally processed and ready to eat foods. In this regard, plant – based antimicrobials could be potential alternatives in the food industry to control food borne pathogens. Utilization of bioactive secondary metabolites as natural antibacterial agents may offer many new applications for food industry. Natural food preservatives targeted at food and food products that are easily contaminated by bacteria are highly desired. The availability of natural compounds developed by exploring more chemistry, activation of plants natural resistance mechanisms and natural products will contribute to sustainable food and food products. The results described in this study clearly indicate that phytol, a diterpenoid possesses the potential to control food borne pathogens, and these finding are in strong agreement with previous reports (Singh and Singh 2003; Murthy et al., 2005). Aiyelaagbe, O.O., Adesoganm, k., Ekundayo, O., and Gloer, J.B. (2007). Antibacterial Diterpenoids from Jatropha podagrica Hook; Phytochemistry 68: 2420-2425. Alisi, C.S., Nwanyanwu C.E, Akujobi, C.O and Ibegbulem, C.O. (2008). Inhibition of Dehydrogenase Activity in Pathogenic Bacteria Isolates by Aqueous Extracts Musa paradisiaca var sapientum. African Journal of Biotechnology 7(12): 1821-1825. Arai, T., Hamashima, H., and Sasatsu, M. (1996). Inhibiting Effects of Fatty Acids, Purified Camellia Oil and Olive Oil on the Growth of Staphylococcus aureus. Jpn. J. Chemother. 44: 786-791. Bajpai, V.K., Al-Reza, S.M., Lee, J.H., and kang, S.C. (2009a). Chemical Composition, Antibacterial and Anxioxidant Activities of Leaf Essential Oil and Extracts of Motasequoia glytostroboides. Miki ex Hu; Food Chem. Toxicol. 47: 1876-1883. Daines, A.M. (2003). The Synthesis of Naturally Occurring Vitamin K and Vitamin K Analogues. Current Org. Chem. 7: 1625-1634. Dellar, J.E., Cole, M.D and Waterman, P.G. (1996). Antimicrobial Abietane Diterpenoids from Plectranthus elegan. Phytochemistry 41.735-738. Netscher, T. (2007). Synthesis of Vitamin E. Vit. and Hormones. 76: 155- 2002. Nweke, C.O., Alisi, C.S., Okolo, J.C. and Nwanyanwu, C.E. (2007). Toxicity of Zinc to Heterotrophic Bacteria of Tropical River Sediments. Appl. Eco. Envron. Res. 5(1): 123-132. Nweke, C.O., Okolo, J.C., Nwanyanwu, C.E and Alisi, C.S. (2006). Response of Planktonic bacteria of New Calabar River to Zinc Stress. Afr. J. Biotechnol. 5(8): 653-658. Nwogu, L.A., Alisi, C.S, Ibegbulem, C.O, Igwe, C.U. (2007). Phytochemical and antimicrobial activity of ethanolic extract of Landolphia owariensis leaf. Afr. J. Biotechnol. 6(7):890-893. Nwogu, L.A., Alisi, C.S, Igwe, C.U., Ujowundu, C.O. (2008). A Comparative Study of the antimicrobial properties of the ethanolic extracts of Landolphia owariensis leaf and root. Afri. J. Biotechnol. 7(4): 368-372. Onuh, M.O. and Igwemma, A.A. (2000). Applied Statistical Techniques for Business and Basic Sciences. Skillmark Media Ltd. Owerri, Imo State. Pp. 176-190, 205-215, 322-338. Praveen-Kumar, J.C. (2003). 2,3,5 – Triphenytetrazolium Chloride (TTC) and Electron Acceptor of Culturable Cell Bacteria, Fungi and Antinomycetes. Biol. Fert. Soil 38:186-189. Rotani, J.F and Volkman, J.K (2003). Organic Geochemistry. Phytol Degradation Products as Biogeochemical Tracers in Aquatic Environments. 34, 1-35. Tauxe, V.R. (2002), Emerging Food Borne Pathogens. Int. J. Food Microbial. 78: 31-34. Ulubelen, A., Oksuz, S., Kolak, U., Bozok-Johansson, C., Celik, C., and Voelter, W. (2000). Antibacterial diterpenes from the Roots of Salvia viridis; Planta Med.66: 458- 462.